Termites may be tiny but there’s nothing small about the damage they can do. 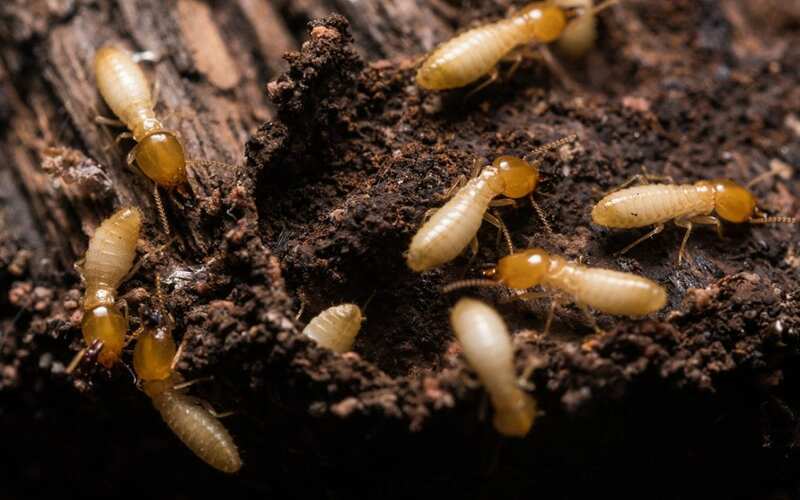 Termite damage costs property owners more than $5 billion every year in the United States with the average cost to repair termite damage topping $3,000. About 600,000 homes are damaged by termites every year, but there are steps you can take to prevent termites in your home. Here’s what you can do to keep your home safe from termites and avoid a costly repair bill in the future. Keeping termites out of your home will require year-round maintenance, especially when it comes to landscaping and lighting around your home. Don’t count on chemicals and other treatments to stop termites; you will need to make the outside of your home as inhospitable to termites as possible and maintain a barrier around your foundation. While there is no guarantee these methods will stop all termites from getting inside, when combined they can significantly reduce your risk of a termite infestation. Landscaping can be great for disguising an unattractive foundation but plants and mulch can also attract termites and give them easy access to your home. Keep shrubbery near the exterior of your home trimmed and keep all plants at least 12 inches away from your exterior wall. This improves airflow and keeps the area around your foundation from staying damp. It also makes it easier for you to spot termite activity. Identify and fix any leaks around your home because water-saturated wood is appealing to subterranean and dampwood termites. Check for leaking water pipes, faucets, outside AC units, and leaks in the basement. Repairing leaks early can help prevent termites in your home. For landscaping near your home, use pine needles instead of traditional mulch. Subterranean termites don’t like pine needles and it can also reduce the presence of other pests like ants. If you can’t use pine needles, choose a non-organic mulch to create a barrier around your home. Moist earth around your home can attract subterranean termites and cause foundation damage. To mitigate water issues, keep sprinklers pointed away from your home. Make sure your yard is properly graded and keep your gutters and downspouts in good condition to divert water away from the foundation. Old tree stumps in your yard aren’t just an eyesore; the rotting wood is also a fine place for termites. A termite colony living in a tree stump may soon relocate into your home in search of more food or to establish a new colony. Have old stumps removed–especially if they are near the house–to prevent termites in your home. Eliminate any contact wood has with soil around your home. There should be at least an 18-inch gap between the soil and any wood elements of your home. One of the most effective treatments a pest control company can offer against termites is a long-lasting liquid termiticide which is applied to the soil immediately next to your home’s slab foundation. While this barrier can be effective, it’s easy to disturb if you create a foundation garden bed. In most cases, the chemical barrier will be 4 inches wide and 6 inches deep to create a shield against termites. Never dig into or cover this soil or it will disturb the chemical barrier and reduce your protection against termites. Termite damage is rarely covered by insurance and it can occur hidden from sight for a long time. Don’t count only on preventative methods to stop termites; after all, they may be hiding in your walls before you even begin. Regular termite inspections every year or two can help detect signs of termites in a timely manner before they cause major damage to your home. Lakeland Home Inspection will arrange a Wood-Destroying Organism Inspection with a state licensed pest control company as an add-on to a Full Home Inspection. Contact us to set up your appointment with Lakeland Home Inspection whether you are buying a home, selling a home, or a homeowner who needs an inspection.